Sadly, due to a bereavement, Neil Copeman from the BBC is unable to come and speak to us this Thursday as expected. Rather than fill in with some short, but great, sessions at the last minute, we decided to postpone the meeting until next Thursday (30th September). 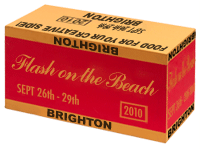 By then, Alun, John and Tim will have returned from Flash on the Beach in Brighton, bubbling with exciting Adobe news, so we’ll be able to let you in on anything new we learn there. We do apologise again for this postponement, and hope you can make it along to OFVM next Thursday, the 30th September for our first autumn session. Next meeting: July 22nd – in a pub! Come and join the Oxford Adobe Groups for a social event for the summer. Flash Oxford, Adobe CS Oxford (aka Oxford Dreamweaver User Group), and Premiere and Post, are having an informal pub gathering to network and chat. Just turn up, grab a drink, and help us thrash out ideas for future events. As ever, it’s free to attend, and there’s no ongoing committment to this volunteer led networking group for creative professionals. Directions: It’s down the alley between Gloucester Green and Magdalen Street. Travelling up from Cornmarket, go past Debenhams then turn left after trying to buy a latte at Starbucks in the old Borders and before buying your sweater from Jaeger. Or look at a map. Maps are good.